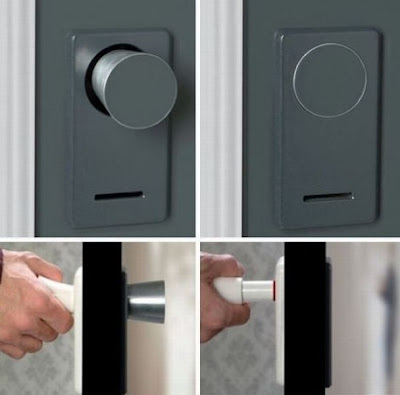 Here's a hotel lock that will keep out unwanted visitors. Only problem: nowhere to hang the "do not disturb" sign. Maybe a magnetic "do not disturb" sign would work. Or Velcro. Many hotels have a card that slips into the lock/unlock slot of the door that says Do Not Disturb, or as Mitch Hedberg suggests, Don't Disturb.